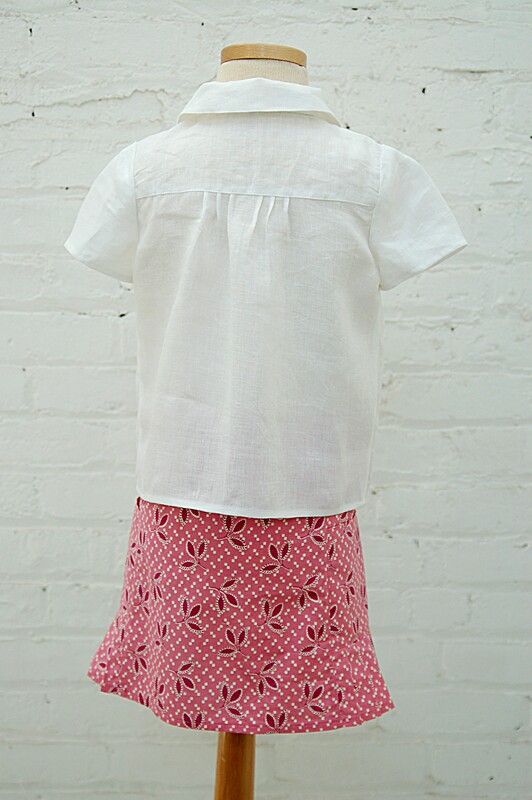 Pintucks add wonderful style to a garment. They always look impressive and complicated but are actually quite easy to sew. With just a few on the Music Class blouse, you’ll get an impressive result without being overwhelmed with the minutiae of sewing a host of them. There are three little pintucks on each side of this blouse, front and back. The pintucks graduate slightly in length for an interesting and subtle detail, each releasing into a tiny pleat at the end of the tuck. When made in a solid fabric (we used handkerchief linen for our sample), the emphasis is on the pintucks. In a print, the pintucks will become a subtle textural element. View A of the blouse (seen above) includes sweet little pleated-cap short sleeves and a classic blouse collar with a nice roll. View B has a band collar and long sleeves with cuffs. You can mix and match collars and sleeve lengths for more variety. 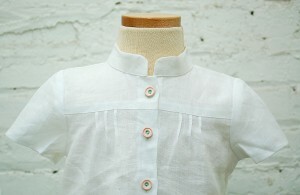 That’s what we’ve done with this sample which features the band collar from View B with the short sleeves from View A. We suggest light- to medium-weight woven fabrics like quilting cotton, broadcloth, lawn, shirting, poplin, and linen for the shirt. The pattern is rated two scissors. 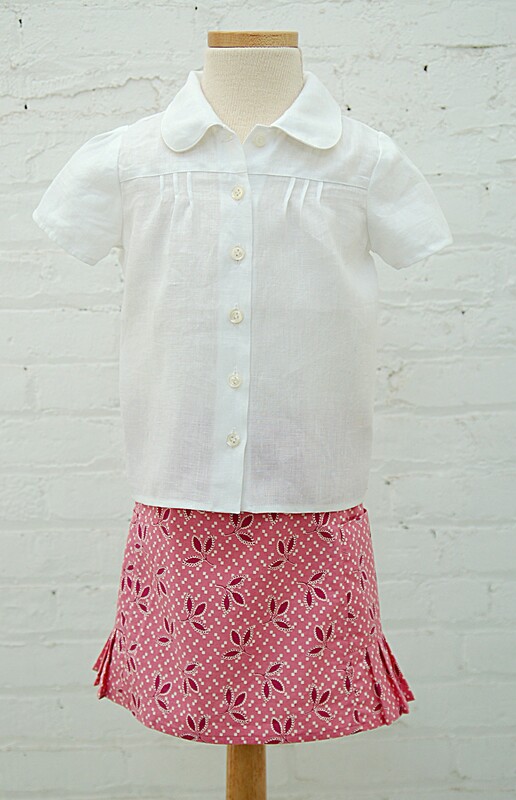 Next, I’ll introduce you to one of my favorite items in the spring collection: the coordinating Music Class skirt which is included in this pattern. Now this outfit I really can’t wait to sew! 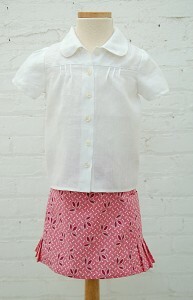 I love the top and the skirts is oh so cute! Somebody has been begging me to make her skirts. So now I will have no excuse not to anymore! So excited for this pattern! I am logging on religiously every morning over breakfast in the hope you will have added another snippet of information about the new patterns. I am really looking forward to sewing all of these – can we pre-order the patterns? Katie, I’m glad you’re excited. We’re not taking retail pre-orders for the patterns, but we will send out an email to our mailing list subscribers as soon as they are available for purchase on the website. We expect that this will be on April 5. This outfit is just beautiful. Can’t wait for the pattern release! I agree with Katie , I have pre washed fabric and I am ready to go ! I really like this blouse!!! I’m actually glad this pattern isn’t up for sale yet because I have too many outfits in the works right now and there is no way I could resist this one!! I just have to make it!